With 70,000 peak candlepower, these high intensity Xenon strobe marker lights clearly mark crew-overboard sites with each brilliant flash. It automatically rights itself and activates when in the water and begins strobing, operating for up to 60 hours on a 6-volt lantern battery. 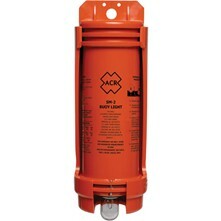 Perfect for commercial marine, petro-marine, cruisers and any application needing a reliable COB light. Marker lights, by design, need to float upright for maximum visibility. The 6-volt lantern batteries provide the ballast for these lights. Although batteries may be the same size, the different chemistries cause them to have varying weights. It is imperative that only the 6-volt battery models suggested are used. Too little ballast and the light will lie over on its side and be ineffective; too much weight and the light may sink. If there are any doubts as to the appropriate weight of the battery, test the light by placing it in shallow water. If it floats upright, it is good, however, if the SM-2 sinks, the battery is too heavy. Please Select 3M ACR Electronics Akron Brass Co Amerex Apollo Marine Bausch & Lomb Billy Pugh Co Brady ID BRK Brooks Equipmen.. Cal-June Caviness Woodwo.. Certified Safet.. Chematics Chief Supply Chieftain Chums Cordova Cortina Cyalume Technol.. Datrex Dupont Fire-Dex Gas Clip Techno.. Glove Guard Guardian Fire Harris Industri.. Haws Howard Leight -.. Ironclad Jackson Safety Junkin Safety Koehler Lakeland Indust.. Master Lock MCR Safety - Cr.. MCR Safety - Me.. MCR Safety - Ri.. Medique Medline Miller Fall Pro.. Moldex MSA Mustang Surviva.. NAFECO North American .. North Safety - .. OccuNomix Ocean Signal Ocenco Orion Pains Wessex Pelican Peltor Pyramex Ray-O-Vac Ringers Gloves Safetec Safety Optical .. Servus - Honeyw.. Showa-Best Sky Ox Stearns Streamlight Survitec Surviv.. System Sensor Taylortec Ty-Flot Uvex Viking Williams Fire &..